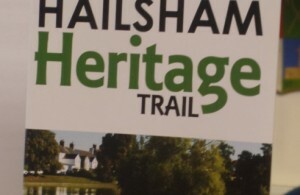 Residents and visitors to Hailsham can learn more about the town’s heritage and historical significance by walking the Hailsham Heritage Trail. In partnership with local historian Paul Endersby, principal writer of the Hailsham Heritage Trail guide, a number of buildings and other locations of interest of historical importance were identified by the Town Council, the majority of which have been included in the Trail which was launched in 2012. The guide includes historical photos and a description of each of the 27 buildings and locations of interest that make up the Hailsham Heritage Trail. The map itself directs people around the town centre and its outskirts visiting such sites as ‘The Stone’, a Grade II listed building, originally built in the 1320s and probably the oldest house in the town and Hailsham Parish Church (formerly St Mary’s Parish Church), a Grade I listed building dating back to the early 15th century. The Trail also covers the ‘Fleur de Lys/Inglenook’ in Market Street, which was originally built in the reign of Elizabeth I (1542) as part of the original hostelry of the town and ‘Cortlandt’ in George Street, a Grade II listed building originally occupied by American Philip van Cortlandt who fought on the British side in the American War of Independence, before ceasing to be a residence in 1932 when it was bought by the then Hailsham Rural District Council for use as offices. Other sites of interest include the Old Court House, Hailsham Pavilion, Wellington Lodge, the old Village School and the site of the former Hailsham Railway Station. Copies of the Hailsham Heritage Map & Guide are available for members of the public to purchase (cost £1) at the Town Council offices in Market Street. Interactive copies of the Trail can be downloaded from the Hailsham Town & Shopping Guide, details of which can be found at www.hailshamforward.co.uk.